So like most American Christians, I have a number of Bibles. I have different translations and some that are study Bibles, some that are hardcover and some that are a bit more lightweight and easier to travel with. And I enjoy most of these Bibles for the unique attributes that they have. About 7 years ago with the recommendation of my husband, I made the switch from the New International Version (NIV) translation to the English Standard Version (ESV). And then a few years after that I tried the Holman Christian Standard Bible (HCSB) as well. That one however, was not my favorite and so I switched back to the ESV. Recently, I say recently but it may have been a year ago, my husband began talking about the Christian Standard Bible (CSB) and he bought me the She Reads Truth CSB Study Bible. I have enjoyed using it, but do find it to be quite heavy and bulky with a small print. I do like the CSB version greatly though and also the information in the She Reads Truth Bible. About a month ago, I was sent the Apologetics CSB Study Bible to review for B&H Publishers. It has quickly become my favorite. From the start, I was a fan of opening the Bible and it staying on the page I turned to without needing to be weight down. And then when I started reading I was excited to see a larger print size that I need as I'm getting older, but not so large that I feel like I'm in my 80s. Then I started scrolling through the articles and reading many of them and the great defense the authors give that are backed up with scripture. If you are in the market for a Bible, I highly recommend the CSB version and really either of the Bibles I mention above would be great for you. If you want some deeper study articles, again both will work for you. 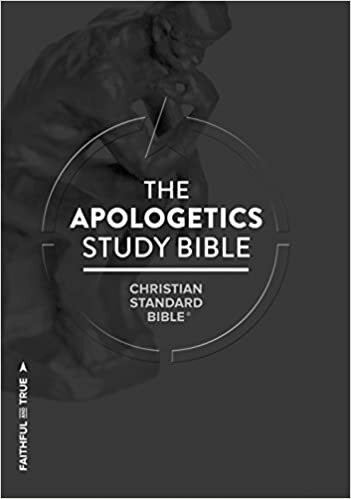 But if you want to see how the Bible gives defense for the common questions most non-believers ask, then I recommend you get the Apologetics Bible. And of course, the main part is to be reading God's word, no matter which version you choose! I'd love to hear from you though, if you have either of the Bibles above and what your thoughts are of them, leave a comment! *I received a free copy of this book from B&H Publishers in exchange for my honest opinion.